Premier specializes in earth auger attachments that range from standard grade, economical systems for the hobby farmer to commercial grade heavy-duty systems for tackling the toughest commercial construction jobs. Whether digging holes for posts, planting trees, digging through dirt or rock, we have a solution to get the job done right. Premier has manufactured tens of thousands of earth auger bits over the years to meet the needs of countless jobs and applications. We offer everything from carbide toothed industrial grade heavy duty augers to light duty general purpose augers. Since we are the manufacture we can even produce custom augers to meet your specific needs. If it’s power and torque you need for installing earth anchors then Premier has the attachments and technology for you. Premier Attachments manufactures a wide variety of both single speed and two-speed drive units that can handle the demands of today’s anchor and pier installers. Not only do we provide the power to screw in the earth anchor we can also provide the technology to ensure that each and every anchor is torqued in at the correct amount. 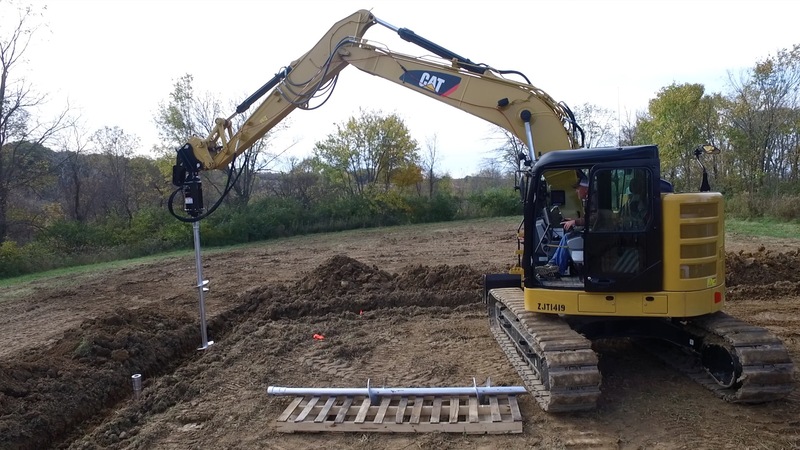 Premier manufactures and sells numerous components, wear parts, re-placement parts and accessories to maximize your over-all efficiency when it comes digging holes with your hydraulic earth auger attachment or post hole digger. From extensions and adapters to carbide auger teeth, you can rest assured that Premier handles the parts you need. Premier offers user-friendly, automatic shift-on-demand, two-speed earth auger drive units that will provide all the torque and speed you need to handle the most difficult jobs. Whether you have a skid steer loader, backhoe loader, mini excavator or excavator, we provide a great diversity of models offering a large scope of capable torque capacities. Premier manufactures trenchers for skid steer loaders with various sizes and options available to meet any trenching need. Our trenchers employ a heavy duty planetary drive system and are engineered for exceptional visibility and structural strength. No matter how unique the application, Premier has the solution for any trenching need. Premier pallet forks are available for use with a variety of equipment, from tractors and skid steer loaders to backhoes. These range from lightweight frames which offers 2000 lb. load capacity to frames engineered for today’s larger commercial construction machines, offering 8000 lb. load capacity. They ship completely assembled, ready to take on the toughest jobs. The Premier Ammbusher line of mowers and brush cutters that we manufacture have earned their reputation as being the best of the best. With all the options and styles we offer you can rest assured that we will have the right skid steer mower or heavy duty brush cutter to fit your needs. With unmatched product and parts availability and outstanding customer service Premier is the best choice for you attachment needs. The Premier Hydraulic Post Driver attachment is a high-quality attachment that is designed for performance, flexibility and quality. With 4 different energy class models and numerous potential options we can provide a post pounder solution for just about any job. Premier bale spear attachments are available for skid steer loaders and tractors. Many spear and mount options are available. We also custom build bale spears to meet specific needs. All our bale spear attachments utilize the Conus II tapered connection and feature high quality German forged tines. These bale spears are tougher and last longer than any major brand on the market..
Premier round bale grabber attachments are available for use on skid steer loaders and tractor loaders. Our heavy duty bale grabber is designed to safely and carefully handle a wide variety of bales. Whether the bales are film wrapped, net wrapped or conventional twine tied rest assured that the Premier round bale grabber will be a durable and productive attachment for years of use. Premier snow plow attachments for tractors and skid steer loaders are designed to take on the worst that winter has in store. They feature heavy-duty all steel construction and a 4-spring moldboard trip for strength and protection. A free floating design allows the blade to follow the contour of the ground, and hydraulic angling of 30 degrees left or right can be achieved.